Michael Douglas' mother, Diana Douglas, has revealed that his marriage troubles with Catherine Zeta-Jones are over and that they dealt with their issues themselves. 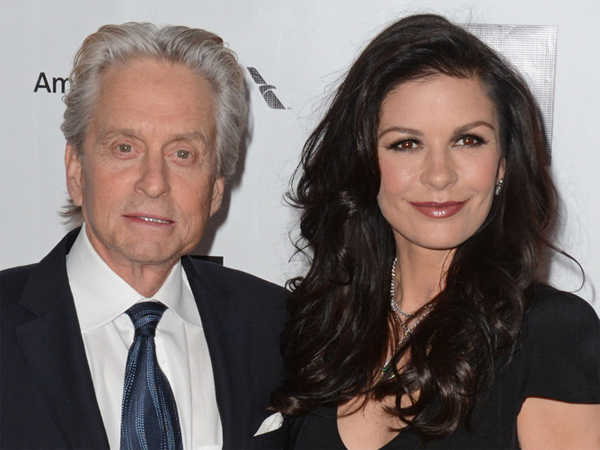 Michael Douglas' mother claims his marriage troubles with Catherine Zeta-Jones are over. The 69-year-old actors' mother Diana Douglas has opened up about her son's brief separation from his wife Catherine Zeta-Jones and says the pair are now firmly back together and over their marriage woes. She said: "They are together. I knew they would work it out. They're both gentle people, not hysterical. They're always very affectionate and easy with each other. I figured the more everybody stayed out of it the better." Catherine's admission that she suffers from bipolar disorder - which has led to her spending time in rehab fighting depression - was said to be one of the reasons for the couple's brief separation, and Diana admits that she thinks her son must have found it difficult to support his wife. She told The Sun newspaper: "I knew she was dealing with depression ... It's probably not an easy thing to understand if you don't have it yourself. But he's and understanding person." Diana also spoke out about Michael's battle with tongue cancer - which he revealed after having first announced he had throat cancer - and admits that he dealt with his illness in his own way, without the help of his family. She added: "He kept it very much to himself. He didn't tell any of the family. It was a private thing. "He gets depressed like everybody does at times. But he's a very pragmatic person. He isn't inclined to dwell on things."